I am a coat girl. In fact, I might even venture so far as to say that I am THE coat girl. I’m pretty keen on them. As someone who dresses very simply (I’m talking monochrome everything, bar red lipstick) and rather androgynously, I truly believe in the power of a coat and its place in both the fashion world and an ensemble: it’s the first noticed aspect of your outfit – thus the most important; it is the cherry on top of your sartorial cake. Call it hyperbole all you want, but the A/W collections, the editors and the high street are all in agreement – whilst before there may have been an ‘it’ coat every season, it can’t be denied that recently, fashion has taken to the coat in all its forms. And here are they that encourage women and men alike to embrace coats in all their glory. Worn by anyone under the voting age, the duffle coat is an awkward allusion to school days, uniforms and badly tied bunches. Worn by anyone older however, and a duffle coat is a girl’s – or guy’s – best friend in the winter months. Not only does it keep you ludicrously warm and dry in the face of our famous British weather, it also keeps you looking effortlessly cool in the meantime. None other than Cara Delevingne walked the Saint Laurent catwalk modelling a dark grey one. Need I say more? The trench coat and its most famous proponent, Burberry, are often heralded as the definition of British style. Images of Sherlock Holmes and his magnifying glass aside, a good trench, in my opinion, is one of the most understated approaches to elegance there is. Throw on a trench coat of whatever hue and some red lipstick and you are instantly transformed into a forties film star. Which is always a good look. Unless you’re a man. In which case, I’d advise skipping the red lipstick. My favourite item of clothing in my entire wardrobe is my camel coat. From the Kooples (an 18th birthday present from my grandma), it is exquisitely cut and makes all the black and white I wear look infinitely more interesting. 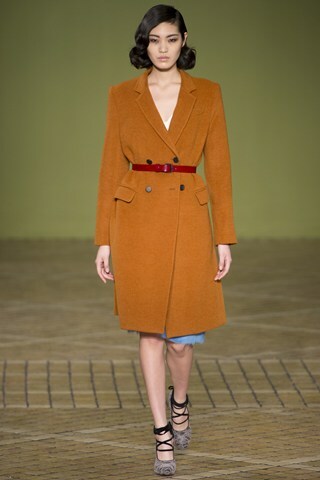 The beauty of a camel coat is that it’s not restricted to one particular cut or style. Whilst mine is very tailored, my friend Beth has a beautiful leather collared boyfriend one that I love, and the one pictured, from Carven AW13, is completely different again. The camel coat evolves as the rest of the fashion industry does; changing in fabric, cut and even shade, but the essence of it remains constant, and therefore, no matter what variant of it you have, it’s always going to be in style. And that definitely makes it worthy of staple status. I’m by turn proud and embarrassed to admit that I own far and away more than just these three coats and don’t nearly consider my collection complete just yet. Apart from my camel coat, my favourite is a sheepskin that was my mum’s in the 80s (try reading that without hearing that bit from Mean Girls), and it was a real struggle not to include sheepskin/fur as a coat staple, as was the case with the boyfriend coat. Perhaps I’ll make an extended version…for now though, for the sake of student loans the world over and this article’s word count, the list ends there. Hannah Beer is a student at University College London. She studies Italian and German. In her spare time Hannah enjoys eating red velvet cupcakes and banging on about feminism. When Hannah grows up she’d like to be Audrey Hepburn – this may prove difficult but let the haters hate. Hannah looks a lot like Audrey Hepburn so she’s half way there. I read this article and found it very interesting, thought it might be something for you. The article is called I’m a coat person. and is located at http://prancingthroughlife.com/2013/10/29/im-a-coat-person-and-you-should-be-too/.